← what a pain in the neck. 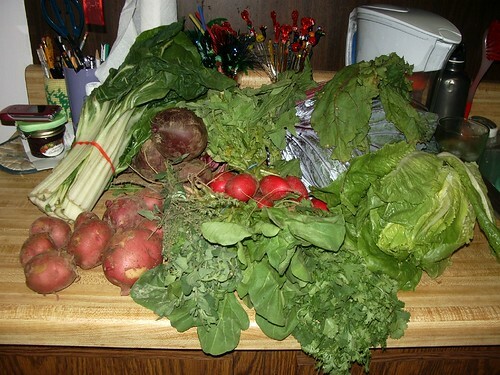 I got swiss chard, potatoes, radishes, sage, cilantro, lettuce, purple cabbage, arugula, and some incredibly big beets. last night I cooked all the (wk 2 and wk 1) beets and made a salad ala aurora and jesse with granny smith apples, drunken goat cheese, and some balsamic vinegar/tiny bit of olive oil. I have an incredibly huge container of this beet salad in my fridge. I also made some indian food so I could put chopped cilantro onto it. yum. and I picked up the pine nuts, so tonight I’ll try the same arugula dish only it will be potentially 10,000x better. so many veggies to eat up! week 1: some radishes, cabbage, dill. I am going to use the cabbage from last week and this week up this weekend (need to find a good non-coleslawy cabbage salad recipe). best case is a salad that includes the dill or potentially sage. I need to also find something to do with the chard that I can also do with the beet greens – the radish greens from last week went to my worm food stash, and I’d like to actually cook the beet and radish greens this week. they’re pretty healthy but not hugely flavorful, sadly.